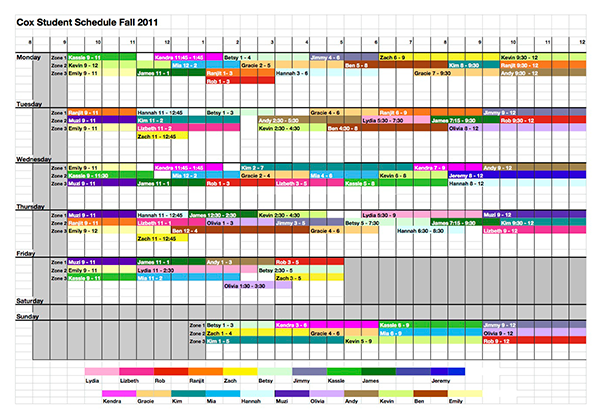 Shuffling paper schedules can be very colorful!... but also very tedious and confusing! With as many as 35 student staff members working in the UTS Student Services team, scheduling work shifts to fully cover operational store front hours in Cox and the Student Tech Support (STS) office has always been a challenge. Generally, the first two weeks of each semester are devoted to the back and forth of shift negotiations with revisions noted on spreadsheets that are printed and then posted at each service desk (see image at right). Between Cox and the STS, we have close to 400 staff hours to fill each week. And these are student jobs where we make every effort to be flexible and work around classes and other campus events. This means these schedules can be maddening (again, see above). Some semesters have had as many as 30 schedule revisions before the end of Drop/Add when the schedule is supposed to be set for the semester. The great irony of all of this effort is there is no week during any semester when the set schedule is the schedule actually worked. 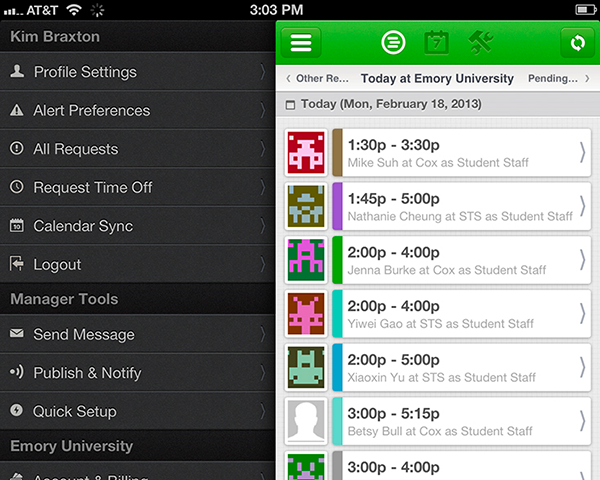 Student staff drop and swap shifts with what must be the only regularity in their busy lives. These ad hoc shift changes have always been negotiated on our LearnLink conferences and only noted for record keeping on each manager’s calendar: Tony Shiver’s in the Computing Center and Robert Kruse’s in the STS (both of Academic Technology Services). After almost ten years of spreadsheet madness, we began looking for a better way to do business this past summer. While the field of web-based shift scheduling software is growing and options to automate the scheduling process increasing, most of the commercial software available is heavily geared towards “normal” business practices that don’t necessarily apply to student staffing (vacation requests, standard work shifts, overtime tracking, etc.). After test driving several software offerings, we decided to give WhenIWork.com a try. Putting the scheduling power into the palms of student employees. WhenIWork puts the responsibility of scheduling hours and dropping/swapping work shifts into the hands of the employee — quite literally, as it has a mobile app where student staff can post hours they’d like to drop, quickly check the day’s schedule to see whom they are working with, or see updates posted from their supervisor. Students can set text alerts to remind them when they are scheduled to work as well as receive texts and email updates on available shifts. There is no more trolling through the LearnLink conference to see who might have hours open and no more mystery around when they might have signed up to work (see image above). Transitioning to WhenIWork did require quite a bit of effort on the management side of the shop. It is a completely different way of managing staff schedules and a lot of letting-go has had to take place in allowing our student staff to control the process. But after just a few weeks in action, our students tell us they LOVE IT. It has yet to be seen whether it will improve productivity or decrease the headaches Tony and Robert endure at the start of each semester, but it has at the very least given our students a sense of responsibility they haven’t had before and propelled us into the Cloud in a way we never expected. This entry was posted in Projects and Processes and tagged Academic Technology Services, Computing Center, manager, Student Tech Support. Bookmark the permalink. Post a comment or leave a trackback: Trackback URL.